Gift Bricks® specializes in engraved brick fundraising, commemorative brick, memorial brick, and personalized engraved tile fundraising for nonprofit organizations. Since 1983 Gift Bricks® has been dedicated in providing successful donor fundraising recognition campaigns. Whatever fundraiser goal your organization has, $1,000 to $1,000,000 or more – we can help! Gift Bricks® experienced professionals can provide you with marketing expertise and guidance to bring your donor projects from concept to completion. We will help you select the right engraved materials and donor displays. You will benefit from our marketing experience with engraved brick and engraved tile donor recognition programs. We strive to help you develop an engraved fundraising campaign that is fun, easy and simple! Your fundraising program can be designed for individual contributors, business donors, corporate donors, and foundations. An optional customized fundraising administrative plan can be designed to meet your program needs. Gift Bricks® has proven success with organizations of every size. Some of our many engraved brick fundraising friends include: botanical gardens, camps, church & religious groups, colleges, universities, alumni & alumnus associations, foundations, EAA, chambers of commerce, main street walkways, hospitals, hospices, historical societies, humane societies, libraries, military institutions, military academies, museums, park and recreation departments, playgrounds, playground manufacturers, schools - daycare centers - preschools - middle schools - high schools - parochial schools - private schools, PTO fundraising, PTSO fundraising, PTA fundraising, stadium expansion projects, professional sports teams, college sports teams, little leagues, veterans & war memorials, YMCA - YWCA, zoos, social clubs, theme parks, as well as numerous other organizations. 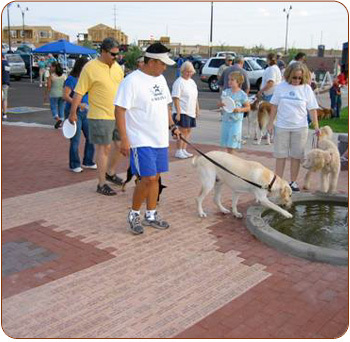 Gift Bricks® is ready to assist you from start to finish with your brick engraved paver, engraved personalized tile programs and donor recognition displays or walkways. When you choose Gift Bricks®, you will have experience and knowledge with you. We are always just a phone call away.